Home nutrition supplements taurine training workout routine Does taurine improve physical performance and post-workout recovery? Taking pills, capsules, powders, or drinks containing taurine may help you improve your athletic performance, performance during your high intensity workout with or without weights, or moderate intensity and prolonged exercise. Here I will mention some studies whichconclude that supplementation with taurine can help reduce oxidative stress, improve the increase in VO2max and optimize post-workout recovery, among other advantages. However, other studies conclude that taking taurine does not significantly affect performance during training or muscle recovery. 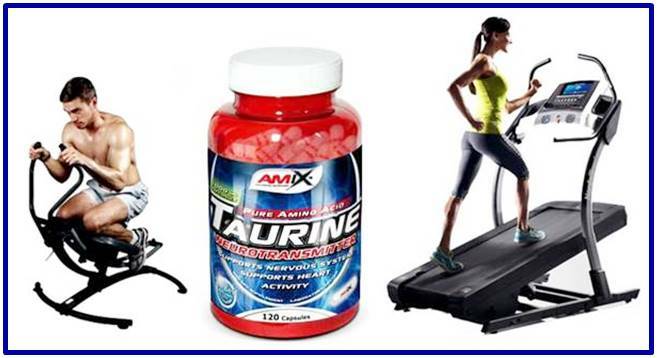 Taurine itself is an amino acid, although some scientists do not consider it as such. Its main function has to do with the metabolism of fats primarily because it intervenes in the formation of bile, so that way fats can be emulsified and well digested. It also helps eliminate free radicals and participates in the body's anti-inflammatory processes. Taurine deficiency Not only can reduce physical performance during your training session, it can also lead to the risk of suffering from some form of heart disease. Of course, when digestion is affected by the deficiency of this amino acid (which compromises the production of bile), the nutritional part (malnutrition) would negatively influence energy metabolic processes. First, I will mention a study that concludes that taurine consumption does not positively affect sports performance since it does not help improve VO2max levels, nor does it influence energy metabolism, either aerobic or anaerobic. Study 1: the objective was to determine the effects of taurine supplementation on speed runners. For this the performance of men with an average age of 26 years was evaluated. From the total of subjects, they chose to divide them into two groups: one group who received a pre-training dosage of 6 grams of taurine during the study's duration, and the other group was simply given a placebo supplement ... Of course they were never told which group they belonged to. Method: The method consisted in that each participant had to run / jog in a treadmill until arriving at the failure or until they could not run more. Unfortunately the speed at which they ran was not possible to look at since the full article of the study has a cost. However, for the times achieved we assume that it can be speeds between 15 km / h and 17 km / h.
RESULTS: The results obtained show that although the time to reach fatigue was higher for the group that consumed the 6 grams of taurine daily, this time was not very significant compared to the time achieved by the runners of the group to which they were supplied a simple placebo. The group supplemented with taurine achieved an average time of 277.30 ± 40.64 seconds while the placebo group achieved an average time of 237.70 ± 66.00 seconds. That is, although the group that consumed taurine lasted longer before reaching total fatigue, the placebo group was not far behind ... or seen from statistical terms: the placebo group was not significantly behind the other group. For this reason it is concluded that taurine does not significantly affect the physical performance, or at least not in this type of physical exercise or running at sub-maximum intensity until complete muscle fatigue. However, this does not mean that in cyclically structured exercises with short intervals of execution and relatively long periods of rest (such as "traditional" weight training sessions), the results have to be the same with not have noticeable effects on performance. "I will now mention two studies that mention positive points regarding the daily consumption of taurine:"
Study 2: In this second study they wanted to show if the daily intake of 7 grams of taurine would increase levels of it (taurine) in the plasma and skeletal muscles of the participants, and if in addition this factor of high consumption of taurine could have effects on the oxidation of fats (fat burning). The results showed that taurine levels did not increase significantly because of the intake of 7 grams daily of this amino acid and of course it is also not demonstrated that the consumption of taurine influences the fat burning (in the oxidation of fats of reservation). However, although the taurine concentration did not increase significantly, the levels of other amino acids such as isoleucine, valine, leucine, arginine, cystine, alanine and glutamate did increase significantly. Due to the above, although it is not mentioned directly, it is probable that the consumption of taurine influences in a positive way in training with or without weights executed at high intensity and for short intervals (and with intervals of rest), if we consider that although taurine itself did not increase significantly, it did the levels of the amino acids mentioned in the previous paragraph. These include the well-known BCAA´s, which have a positive effect on both physical performance and recovery, mainly because they delay or lessen fatigue mainly of the nervous system, and also because they influence the production of nitric oxide, glutamine, etc. Introduction to study number 3: exhaustive exercise is known to increase the production of free radicals that can induce a chain of events called lipid peroxidation. The highly reactive free radicals modify several components that give rise to tissue damage. It has also been shown that DNA damage can occur because of oxidative stress after exercise of high intensity. The potential of dietary antioxidants to detoxify peroxides produced during exercise has received increasing attention in recent years. Taurine, 2-aminoethanesulfonic acid, is one of the most abundant amino acids in mammalian cells. Taurine has cytoprotective and enantiostatic properties through its actions on antioxidation, detoxification, osmoregulation, membrane stabilization and regulation of intracellular calcium flux due to its molecular structure. This indicates that taurine can protect against damage due to oxidation in many stress conditions, and also helps to attenuate cell necrosis and apoptosis (programmed cell death). Therefore, it is reasonable to hypothesize that taurine may exert a beneficial effect on the prevention of DNA damage in white blood cells (WBC) due to exhaustive exercise induced oxidative damage. Objective and method: eleven 18- to 20-year-old men (all of whom were sedentary) were selected to assess the protective effects of exercise-induced oxidative stress on taurine supplementation and the effect of taurine supplementation on exercise performance... to participate in two identical exercise cycle ergometer (at 60 rpm) until exhaustion (fatigue). Participants received all 6 grams of taurine daily. They were evaluated before starting the study and also at the end of the study (after 7 days) to compare possible changes. Results and conclusions: After supplementation, the change in taurine concentration showed positive correlations with changes in exercise time to exhaustion and maximal workload (the level of VO2max and time to fatigue). The results suggest that taurine can attenuate exercise-induced damage and improve exercise capacity due to its cellular protective properties. For some types of exercise and some types of people, it is likely that the consumption of taurine does not have significant positive effects on physical / sports performance and much less on fat burning. For example, in high-performance athletes, the changes will not be significant for obvious reasons. At the same time, in other types of people such as sedentary people (as shown in study 3), the results can be observed significantly for obvious reasons ... that is, because there is much to improve, while the high-performance athletes or more trained people already have higher peaks in physiological adaptations achieved, so there is very little that they have to improve compared to starting point. Study 2: Stuart D. Galloway, Jason L. Talanian, Anna K. Shoveller, George J. F. Heigenhauser, Lawrence L. Spriet (2008). Seven days of oral taurine supplementation does not increase muscle taurine content or alter substrate metabolism during prolonged exercise in humans. Study 3: M. Zhang et al. (2004). Role of taurine supplementation to prevent exercise-induced oxidative stress in healthy young men.